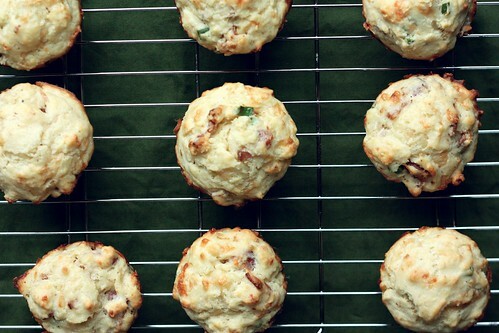 Bacon, Gruyere, and Scallion Muffins – Elly Says Opa! These muffins came about when we had extra gruyere cheese to use up. My husband, who normally sticks really closely to the grocery list I make, ventured out and got some gruyere because “it was on sale.” Well, great, but even “on sale” gruyere is, like, a second mortgage. And when you’ve already made a meal plan that does not include gruyere, it’s not the best impulse buy. So, I added a couple things that included gruyere to the following week’s menu, but I knew we’d still have extra. I was searching and came across these and, well, I stopped searching. When I first read through the ingredient list, I thought it was really weird that there was no butter or oil in these. I mean, how is that possible? And then I realized where the fat came from – bacon drippings. So, yeah, that right there should be enough to nudge you to make these. We all really loved these and they went just a liiiittle too quickly. They are best the day you make them, but they are still good as leftovers, just heated for a few seconds (my son was very excited to tell his teachers how he was eating BACON muffins for breakfast, not blueberry or apple, BACON). Next time gruyere unexpectedly shows up in my fridge, I won’t be nearly as disconcerted. Preheat the oven to 425 and set a rack in the middle position. Grease a muffin tin. Cook the bacon until it is crisp and has rendered most of its fat. Reserve 1/4 cup of the bacon fat and drain the bacon on paper towels; chop bacon into small pieces (Note: I used center-cut, leaner bacon, so I had to add a little oil to reach 1/4 cup). In a bowl, whisk together the flour, baking powder, sugar, salt, pepper, cheese, scallions, and crumbled bacon. In a small bowl, whisk together the milk, egg, Dijon, and bacon fat. Add the milk mixture to the flour mixture, stirring just to combine (don’t overmix). Divide the batter evenly among muffin tins (Note: This recipe was supposed to yield 12, but I only made 10 and they were not huge by any means). Bake for 14-18 minutes, until a tester comes out clean.